The Japanese Tohuku earthquake and tsunami of 11 March, 2011, exceeded the economic toll of the 2004 Boxing Day Sumatran event. The extensive tsunami damage to Asian resorts from the 26 December 2004 tidal wave is hard to spot now and it is business as usual for the most part while Sulawesi struggles to recover from a 28 September earthquake and tsunami that left hundreds dead or missing. TSUNAMIs are not uncommon in the Asia-Pacific region where vast tectonic plates crunch together, slipping under and over each other, pushing up mountain ranges and sinking continental shelves in an age-old geological tussle. On 28 September 2018 a 20ft tsunami wave roared into Palu Bay, Central Sulawesi, in Indonesia, pulverising Palu town and innundating and destroying entire towns (like Donggala) along the bay leaving hundreds dead or missing. This immediately followed a 7.5 magnitude earthquake. The area is not a popular resort location. The popular dive resort destination Manado remained safe and unaffected. The Island of Lombok was rattled too (with much of the north devastated) in a series of powerful quakes July/August 2018. On 11 March, 2011, an 8.9-scale earthquake that struck Northeastern Japan, sent waves - one as high as 38.9m - crashing into the coastline with an intensity not witnessed since the December 2004 Sumatran event. Referred to as the Great Tohuku Earthquake, the resultant turbulence affected the Kuril Islands in Russia and Hawaiian waters too. In economic terms, it is regarded as the one of the 'costliest natural catastrophes' to date. A Java tsunami alert was in place along southern Java as a 7.7 Richter scale earthquake sparked a two-metre high tidal surge that hit the tourist beach area of Pangandaran, Indonesia, on 17 July, 2006. Several hundred persons were dead or missing. No major international resort was located immediately in this area but local chalets and hotels were hard hit. Also affected was Cilacap district. The undersea earthquake was centred about 150 miles south of the central Indonesian island of Java. This quake follows in the heels of the devastating Java June 2006 quake that rattled Yogyakarta and is along the same fault line that produced the Boxing Day Asia tsunami. The Indonesian capital of Jakarta about 150km away was not affected by the latest South Java tsunami as it lies on the north shore of the island. The tourist resort island of Bali was also unaffected. The last major event in this region was the East Java earthquake of 3 June 1994 which caused a localised tsunami whose outer ripples reached West Bali causing no damage but some beach erosion. On 28 March, 2005,earthquake touching 8.7 on the Richter scale sent alarm bells ringing but no tsunami was reported in tourist areas. This was followed by another brief alert late July 2005 when a 7.2 earthquake jolted the Andaman Islands and India's Tamil Nadu. In Phuket, Penang and Langkawi things are rapidly returning to normal. Following the March temblor, the Malaysian Association of Hotels was quick to issue circulars pointing to normality of operations in all areas. The eleven biggest quakes since 1900 and associated tsunami activity. ECUADOR 31 January, 1906, 8.8 on the Richter scale. Tsunami runs along the coast to Colombia and is felt in San Francisco and Japan. RUSSIA 3 February, 1923, 8.5. Kamchatka Peninsula is rocked. INDONESIA 1 February, 1938, 8.5. Seabed quake causes tsunamis in the Banda Sea. TIBET 15 August, 1950, 8.6. Quake hits eastern Tibet and the Brahmaputra River basin in northeast India. RUSSIA 4 November, 1952, 9.0. Tsunami strikes Hawaii. ALASKA 9 March, 1957, 9.1. Umnak Island. A 15m tsunami radiates out from here on to Hawaii. CHILE 22 May, 1960, 9.5. Near Santiago. Followed by tidal waves and volcanic activity. ALASKA 28 March, 1964, 9.2. Quake followed by tsunami. Affects some areas of western Canada. ALASKA 4 February, 1965, 8.7. Creates a 10m high tsunami. INDONESIA 26 December, 2004, 9.0. Quake hits Aceh and tsunami radiates out across Indian Ocean hitting Thailand, India, Sri Lanka and even Somalia. JAPAN 11 March, 2011, 8.9. Northeastern Japan tsunami causes greatest economic damage in history. And the Pacific Asia Travel Association noted, with optimism, the speed of the official response - the clearest indicator that more effective systems are now in place. PATA chief Peter de Jong added: "It is important that the latest setback does not disrupt the physical and psychological reconstruction process underway in travel-dependent communities in the region." The earlier tsunami that swept through the Indian Ocean following an Indonesian quake measuring 9.0 on the Richter scale, has already left an indelible mark on the tourist landscape of Asia. Following extensive reconstruction, a large number of resort areas are open for business. Wooing back visitors is not simply a matter of opportunistic commerce – it is an issue of survival. This report continues to look at resort damage, access, airports and lists help lines and telephone numbers in affected areas where available. It is by no means an exhaustive account and information will be updated on a regular basis. Hotels, resorts and travellers with useful, specific, information, are invited to update us by e-mail. Send Us Mail. 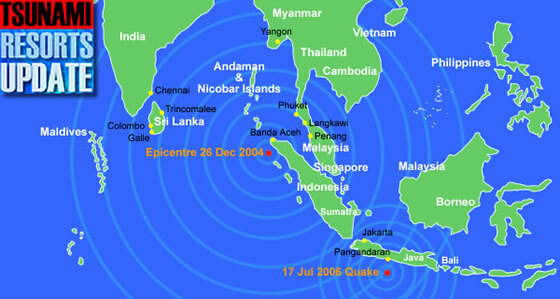 The December 2004 Boxing Day quake originated at the northern tip of the Indonesian island of Sumatra near Banda Aceh from where the tidal surge radiated out, reaching as far as Seychelles and Somalia, across the Indian Ocean in Africa. Worst hit were Sri Lanka (along the eastern and southern coastline), and India (along its long southeastern shoreline). Not an area known for tsunami activity, unlike the Pacific Ocean where extensive early-warning systems are in place, the sea-bed tectonic plate shift caught the region off guard. The last major tsunami in the remote neighbourhood, was in Papua New Guinea, far to the east, in July 1998. The province of Aceh was turned into a water-logged shambles and is slowly recovering. Thailand’s Phuket (largely around Patong and Kamala Beach), Phi Phi and Khao Lak suffered damage as did, to a much lesser extent, Penang and Langkawi in neighbouring Malaysia. The toll in human life was capricious. Northern Sumatra, Indonesia, suffered staggering losses. Three thousand miles west of Sumatra, coastal East Africa lost more people (309) than Malaysia, Burma and Maldives put together. Most of Indonesia is operating completely normally. This is true of Bali, Lombok, Jogjakarta, and Jakarta, all far removed from the seismic event. People worrying about the impact of the tsunami - or post tsunami events - on Chiang Mai, Pattaya, Philippines, Kerala and Goa, need only peruse a decent map for a minute to conclude that all is well. It is business as usual in much of Thailand and Malaysia’s east – Sabah, Sarawak, Borneo (Kalimantan), Brunei, Koh Samui and so on. Said PATA CEO Peter de Jong, “Outside the Indian Ocean rim areas, the travel industry continues its normal business.” PATA ran useful updates with several handy links on its Indian Ocean Crisis pages at www.pata.org. De Jong told SmartTravelAsia.Com, "The best thing for [travellers] to do is to proceed with their travel plans. Don't be intimidated by the tidal wave of images on your TV screen." Donations: Several agencies had appealed for tsunami relief donations and Thai Airways International came up with an innovative air miles donation scheme to aid relief efforts in southern Thailand. Emergency contacts and missing persons: To look for missing friends and relatives or to post details Phuket Gazette rab a site to help out while an international list run by the Red Cross covering various emergencies and situations is at www.familylinks.icrc.org. The rest of this article is our actual historical report on - and record of - the event as it unfolded. Suraphon Svetasreni of the Tourism Authority of Thailand reported that by the last week of January 2005, 78 percent of Phuket was operational with 33,587 rooms on line. In Krabi, 91.64 percent of the room inventory escaped undamaged while in Trang, "100 percent of the tourism infrastructure is intact". According to Suraphon, "While some shallows saw marine damage, deep coral is safe and in places like the Similans, all livaboards are operational." Suraphon adds that Patong's clean-up will be directed towards turning it into a "model beach" with proper zoning and a fresh new look. Hard hit was the normally bustling entertainment epicentre of Patong. Much of the initial television footage centred here. Tidal waters came inland a fair distance destroying much of the beachfront and causing flood damage to several resorts in the area like Club Andaman (still operational though some cottages were initially damaged), Phuket Tropica, Patong Beach Resort, Holiday Inn Resort Phuket, Patong Merlin, Impiana Phuket Cabana and the Amari Coral Beach. Amari Coral Beach reopened on 1 July, 2005, after a major refurbishment, restyling of all rooms, a new-look lobby, a redesigned La Gritta Italian Restaurant, two swimming pools and the Sivara Spa. The boutique Burasari Patong (www.burasari.com), partially protected in a sheltered soi, reopened 3 February, 2005, after a swift ground floor and pool area clean-up and refurbishment personally directed by livewire owner Lily Udomkunnatum. Under-construction lifestyle resort Burasari Jungceylon was far enough inland to escape flooding and sister Rena Udomkunnatum is pressing ahead with that development. 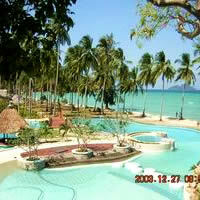 The Patong Merlin Hotel reopened in late March, 2005, while the Merlin Beach Resort became operational in April 2005. With its breezy location on a hillside, the stylish Thai-villa Baan Yin Dee (www.baanyindee.com) was completely unaffected and is operating normally. According to Club Andaman's manager Adison Sitthiwong, "Cottages are going to be completely refurblished. Only 38 cottages (Andaman Cottages) out of 52 will be in operation. The remaining 14 will be demolished and upgraded." pr@clubandaman.com. Club Andaman cottages reopened for booking in February. Patong is being cleaned up fast. While the beachfront road - where most of the damage occurred - is quiet, inner streets are abustle with restaurants, shops, bars, and even that unfailing barometer of health, pirate DVD stalls, back in action. The popular beach road seafood restaurant Savoey has reopened and, up the hill, Baan Rim Pa is is in fine health. Farther south, however, Montri's Kitchen is closed. Up the coast, JW Marriott Phuket Resort & Spa (marriott.com/property/propertypage/hktjw) is humming and well back on track. Says group PR director Lee Sutton, “Damage at the resort was confined to the beach, gardens and pool area.” By the second week of January all services and facilites were operational, according to Lee. The Minor Group which owns the JW (through Royal Garden resorts) had set up a relief fund. The former tin-mine turned tourism icon, Laguna Phuket, “was protected from a direct hit by the headland to its South. Says spokeswoman Debbie Dionysius, “Of the five hotels at Laguna Phuket, Banyan Tree Phuket (www.banyantree.com/en/phuket/index.html) and Allamanda Laguna Phuket were unscathed apart from damage to a small beach restaurant operated by Banyan Tree.” The Sheraton Grande Laguna Phuket (www.starwood.com/phuket) had six rooms out of commission, and Laguna Beach Resort 14. Sheraton is functioning normally with pool and beach areas open. The Thai beachside restaurant is being rebuilt. The Dusit Laguna Resort (phuket.dusit.com) is moving swiftly to repair 24 beachfront rooms that suffered flood damage. According to Dusit Laguna general manager Sam-Erik Ruttman, “A wave surge inundated some groundfloor rooms of the North Wing, La Trattoria [restaurant] and Casuarina Hut. The garden and beach areas including pool are already open and the repaired guest rooms commenced business late January 2005. The Dusit Ballroom has reopened while the two restaurants have been entirely rebuilt and remodelled. 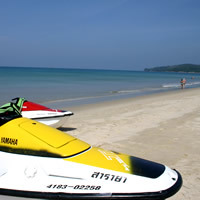 For Laguna Phuket enquiries: http://www.lagunaphuket.com or Tel: [66-76] 324-060. Laguna Phuket has set up a tsunami relief fund. Details and donations at www.lagunaphuket.com/tsunamifund. The Chedi Phuket which received a fair bit of international publicity with a sequence of photographs showing a wall of water overwhelming the beach restaurant, was fully operational when I visited in the first week of January 2005. Only the “Beach Restaurant and 19 Beach and Deluxe Cottages are in need of repair,” according to general manager Daniel Meury (Tel: [66-76] 324-017 or www.ghmhotels.com). Adds Meury, "The affected rooms and the Beach Restaurant will be renovated between April and October." The beach restaurant lawns have been restored and will host seafood barbecues in late January. The beach itself, as in so many other areas, is in pristine shape and shows no evidence of the brief surge. Chedi guests were evacuated from the beach in time as were guests at the Amanpuri (www.amanresorts.com) which shares the same idyllic cove. Both resorts are set on stilted walkways, largely out of harm’s way. Says Trina Ebert of Amanresorts, “The only structural damage to [Amanpuri] was the Beach Gym. Access roads are open, the resort is fully functional and none of the Aman Cruises vessels were damaged. Amanpuri is fully functional and the beach area shows no signs of damage. An alert young Aman employee spotted the tide receeding dramatically and called the cruise director who immediately sounded the alarm, evacuating guests from the beach and calling incredulous resorts farther up the coast to warn them of impending danger. In an unprecedented move to help "revitalise the island’s tourism" Amanresorts has announced "a 50 percent reduction on its rack rates for stays at Amanpuri until October 2005." Kamala Beach has been hard hit and the shattered Kamala Beach Resort is mute testament to the power of the water. The resort's marine frontage was hard hit. It expects to resume operation sometime in August, 2005. Beach activity is returning, albeit slowly. The hillside Kamala Beach Estate is fine. Thavorn Beach Village & Spa (tel: [66-76] 290-334) The Thavorn Beach Village & Spa reopened after repairs and refurbishment on 15 March 2005 (www.thavornbeachvillage.com). At the Le Méridien Phuket Beach Resort (www.meridien.phuket.com) all guests were "evacuated to safe areas and there were no casualties". According to general manager Philippe Seigle, "The third wave came almost right up to the elevated lobby". The swimming pools and recreational areas suffered damage as did the restaurants and public areas on the ground floor. The Le Meridien underwent a dramatic facelift and reopened 15 August 2005 with an intro rate of US$95++. Similarly unaffected are the chic new Twin Palms (www.twinpalms-phuket.com), set away from Surin Beach near The Chedi, the Phuket Orchid, Novotel Patong, Panwa Beach Resort, and the The Royal Phuket Yacht Club (www.theroyalphuketyachtclub.com). Twinpalms has reopened its Beach Club on Surin Beach (which escaped damage and is now apparently certified as a "no-casualty" beach). The Evason Phuket Resort (www.sixsenses.com/evason-phuket/index.php) escaped damage save to the jetty and says it is fully operational. Tropical Garden Resort and Serene Resort in Kata were not affected by the tsunami as the properties stand on higher ground. They report all restaurants and rooms are on line with electricity, water, and full service. Nearby, the Boathouse is closed for repair. Also unaffected is the tucked-away Andaman White Beach Resort which had a miraculous escape. It is unscathed save for a damaged beach bar. According to general manager Luciano Lazzarin, "The wave changed direction at the last minute and approached us from the northwest reaching to the lip of the pool and lapping the underside of some beach front cottages." The water did not spill into the pool or affect the lower cottages. Fully operational are the Diamond Cottage Resort & Spa, Rydges Amora Beach Resort, Thara Patong, Deevana Patong Resort & Spa and Patong Lodge Hotel. The spread-out Trisara Resort Phuket suffered minor damage to the pool but the clean-up is complete and no villas - all perched on higher ground - were affected. The pool, restaurant, bar and kitchen were all running normally when this correspondent visited first week of January 2005. Elsewhere, properties affected to a lesser or greater extent, include Kata Thani, Pearl Village, Banthai Beach and Club Med. In a separate development, unconnected to the tsunami, the new Crowne Plaza Karon Beach is open for business. Phuket airport has been running normally for several months and, with some pick-up in business, international flights are coming back. Useful telephone numbers: Bangkok Phuket Hospital [66-76] 254-429, Mission Hospital Phuket [66-76] 237-220, Patong Hospital [66-76] 344-225, Phuket International Hospital [66-76] 249-400, Ruan Paet Hospital [66-76] 211-578, Thalang Hospital [66-76] 311-033, Vachira Phuket Hospital [66-76] 217-294. Royal Thai Airforce help centre [66-2] 534-1702, Phuket call centre [66-76] 216-101, Ranong call centre [66-77] 813-401. Useful Sites: The Phuket Gazette has posted a message board for those looking for missing persons at www.phuketgazette.com. A similar set-up is at www.phuketcity.com. A very useful and comprehensive list of resorts in operation and out of commission in Phuket can be found at Phuket.Com while missing persons can be traced at www.csiphuket.com. The resort island of Phi Phi popularised in the movie The Beach is hard hit. The tourist areas on Phi Phi Don, the larger island, have been reduced to rubble. Volunteers continue to search for survivors and help clean up. All beachfront properties suffered extensive damage and most were simply swept away as the tsunami roared through the narrow, picturesque white-sand saddle separating two low hills. Inspections of outlying coral are underway to assess undersea damage. According to Carmen Lam of InterContinental Hotels Group, “All the guests and staff at the Holiday Inn Resort Phi Phi Island, Thailand have been safely accounted for.” InterCon’s 24-hour emergency hotline is [61-2] 9935-8313. According to InterCon, "The Holiday Inn Resort Phi Phi Island has not sustained any damage to its buildings. The hotel is fully operational and is continuing to welcome guests." The Phi Phi Island Village was unaffected and is running normally. Says general manager Chaiyun Trisuwan, "The big wave came through Lodalum Bay and Tongsai Bay. It did not affect us as we were on the sheltered east side of Phi Phi Don." 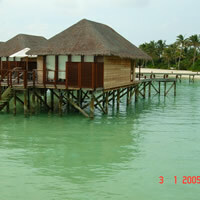 The water rose "two feet" but did not damage the Thai-style bungalows on stilts. According to Kitsana Kaewtumrong of the Tourism Authority of Thailand, the smaller Phi Phi Le Island remains largely intact and the scenic Maya Bay familiar to day-trippers was not hit by the surge. As the surge progressed southwards, it left swathes of lower Krabi and Trang unscathed. Phulay Beach Krabi Aprime Resort general manager Heribert Gaksch reports that all his guests and staff are safe and “there is no damage to our property at all”. Tel: [66-75] 628-111 or hotel@phulaybeach.com. According to Amari Group spokeswoman Alex Constantine, while the Phuket property is being assessed, “all the other properties including Trang, are fine and did not suffer damage or disruption to any operations.” This includes the luxurious new Amari Trang Beach Resort (www.amari.com/trangbeach). 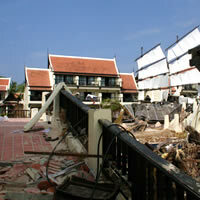 On Koh Lanta, the Pimalai Resort & Spa had damage to some beachfront villas and a beach restaurant. 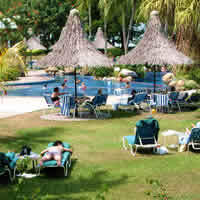 The Royal Lanta Resort is running despite minor disruptions and damage to the pool while the Twin Bay Resort is closed till late 2005. According to general manager Greg Findlay, the Sheraton Krabi Beach Resort (www.sheraton.com) has "all facilities in operation including our pool and beaches". Krabi Airport is running normally. Tubkaak is unaffected. Rayavadee (www.rayavadee.com) suffered some sea-water damage to the beach fronting grounds which are currently being replanted. According to the group's Paul van Frank, "Rayavadee suffered no loss of life and only minor damage to the property... largely thanks to [its] sheltered location." The resort escaped largely unscathed and reopened in March, 2005. The Racha (www.sanctuaryresorts.com) on Koh Racha is rebuilding its beach bungalows. Useful telephone numbers: Krabi call centre [66-75] 611-302, 624-161/3, Phang Nga call centre [66-76] 411-525. Damage was most severe at the emerging rustic resort area of Khao Lak a one-hour 70km drive north of Phuket Airport. As far as the eye could see the coast had been flattened with resorts smashed and debris flung everywhere. Thai Princess Ubolratana Rajakanya lost her son Khun Poom Jensen here, and a coast guard ship, patrolling offshore for the royal family's protection, was flung hundreds of metres inland. At Khao Lak the tsunami's destruction has been complete and unequivocal. Most resorts, including Anantara Khao Lak (www.anantara.com), La Flora (www.sanctuaryresorts.com), Mukdara Khao Lak and Khao Lak Paradise were practically wiped out. La Flora is busy rebuilding and hopes to reopen shortly. Khao Lak Resort and Khao Lak Seaview suffered damage to lower floors while, miraculously, the Khaolak Merlin Resort (tel: [66-76] 428-300, khaolakmerlin@merlinphuket.com) escaped with half the property and one large swimming pool, intact on a hill slope. The Merlin, or at least a large portion of it, remains operational. 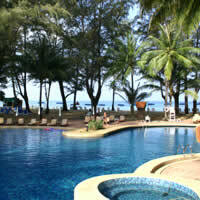 According to a hotel spokesperson, "Khaolak Merlin Resort is currently 70 percent operational. As many as 175 rooms along with two pools, the coffee shop, the health spa, the fitness centre, the lobby lounge, the ballroom and seminar room were NOT damaged. All pumping systems, pure water supply and electricity systems are operational. "Farthest up the coast, the new Le Meridien Khao Lak suffered extensive damage to lower floors and villas. 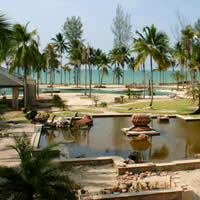 The Le Meridien Khao Lak opened October, 2005 with special promotional rates. The new rooms feature 42-inch plasma flat-screen televisions. The resort offers Wireless Broadband access and a spa. The Sofitel Magic Lagoon Resort & Spa Khao Lak is wrecked. This property suffered perhaps the most extensive losses in the area. Accor, the French hotel management group that runs Sofitel responded speedily with call centres in Paris (tel: [33-1] 4538-8484, 4538-8483), and Bangkok (tel: [66-2] 237-6064). Accor is assisting guests with "psychological and material aid, as well as helping with repatriation." The charming 56-room boutique property The Sarojin, Khao Lak, has been renovated and reconstructed entirely and is also open for business. Tourism Malaysia says things are rapidly getting back to normal. Much of peninsular Malaysia was shielded from larger Indian Ocean waves by the island of Sumatra. As a result, "it is relatively safe from the direct effects of the tsunami aftershocks." Both Penang and Langkawi are open for business after a brisk beach clean up. Neither island was affected unduly. In Penang the tourist strip of Batu Ferringhi is running normally and flood damage to resorts along the coast was minimal. Some grounds require re-turfing and some groundfloor repair is underway but, in the main, the travel infrastructure is completely intact and Malaysia is welcoming visitors. Much of Langkawi is operating normally though several beach resorts suffered minor damage. The island was protected to some extent by a ring of offshore islands that absorbed the tsunami’s energy. Northshore based The Datai, run by GHM Hotels (www.ghmhotels.com) escaped unscathed with just furniture damage along the beach. Pelangi Beach & Spa Resort (www.pelangibeachresort.com) reported flood damage to some beachfront rooms and the beach bar as well as loss of airconditioning to some rooms. The pool has now been cleaned up and all operations are back to normal though the grounds show some wear from the flood. All guests were evacuated to higher ground during the peak of the tsunami event, according to general manager Francois Sigrist. The Casa Del Mar Resort suffered some damage to the pool, lower patio and front lawns. It reports the "structure is intact and sound" and all operations, including the pool, have returned to normal. Occupying a prime stretch of beach, the Tanjung Rhu Resort did “not sustain any damage and the resort is still operating as normal.” The Sheraton Langkawi Beach Resort (www.sheraton.com) and the Sheraton Perdana Resort Langkawi are both in operation. The Perdana beach area is open to the public. Useful telephone numbers: Hospital [60-4] 966-3333. Airport [60-4] 955-1311. According to Shangri-La’s Rasa Sayang and Golden Sands Resort (www.shangri-la.com), “There were no casualties or damage on the properties. All the guests and employees are safe.” Adds general manager Arbind Shrestha, “We are fortunate that Batu Feringgi is relatively sheltered and this has helped to soften the tidal wave hitting our shores.” The Shangri-las are functioning normally. The Bayview Beach Resort along the same strip, is functioning normally. Apart from sea water encroachment on the grounds during the tsunami event there was no damage to property or injury to guests. The lawns have been cleared and cleaned, the hotel reports. General manager of the Grand Plaza Parkroyal, Penang, Mark Losi affirms that "Beach and watersports activities have resumed in full force." The tsunami waves "did not affect the property at all as the hotel grounds are located higher and further up the beach", according to Losi. The stately ocean-fronting Eastern & Oriental Hotel saw waves crash over its pool and sweep through the lobby but, says spokeswoman Elizabeth Dass, “Fortunately, none of our suites were affected and no guests were injured.” At the Holiday Inn Resort Penang (www.penang.holiday-inn.com), “all guests and staff have been accounted for and to date there have been no casualties”. A high-tower "Baywatch style early warning system, similar to that offered by Penang beach hotels, is to be extended to other beaches to alert the public of any impending tsunamis", reports The Star newspaper. Well positioned Batu Ferringhi lifeguards were apparently able to raise the alarm and clear beaches in time. Useful telephone numbers: Penang State Operations Rooms tel : [60-4] 262-1819, 265 6308; North Seberang Perai Operations Room tel : [60-4] 323-9122, Meteorological Services Department tel: [60-3] 7967-8062, The Royal Malaysian Police tel: [60-3] 2262-6555, Penang Hospital tel: [60-4] 229-3333; Butterworth Hospital tel: [60-4] 323-3333. The Pangkor Laut Resort (www.pangkorlautresort.com) (farther south along the surge course in the Malacca Strait) and Tanjong Jara Resort (on the other side of the peninsula) operated by YTL Hotels & Properties “are safe” according to spokeswoman Uzma Nawawi. Sri Lanka suffered serious casualties along its eastern and southern coasts with the historic town of Galle partially submerged for a brief while. Colombo suffered some beach damage but major hotels are fine. Trincomalee and the east coast will take a while to recover. West coast beach areas like Negombo and above Colombo are in reasonably good shape. The Taj Exotica Resort, Bentota, suffered some damage to a few ground floor rooms but is fully operational now. The Taj Samudra and Airport Garden Hotel were not affected. Udaya Nanayakkara, the chairman of the Sri Lanka Tourism Board, earlier moved quickly to scotch reports of exposed land mines in tourist areas following the ravages of the tsunami. "The fact is, these land mines are in very remote areas in the north as far away as 500km from the southern coast where most tourist resorts are in operation," he says. This was echoed by Brigadier Daya Ratnayake, chief of the National De-mining Commission, who adds, "We see no threat to tourists, the general public, or aid workers from mines or the possibility of mines having moved." According to Lalin de Mel of Jetwing, the areas from "Negombo to Kalutara did not [suffer] major impact and all hotels were up and running in two days." De Mel points to normal operations in Kandy, Sigiriya, Habarana and Nuwara Eliya as reasons for tourists to return. He laments the tendency in some quarters to drive prices down, adding, "There is also a group of people trying to take advantage of the situation by asking for special offers and discounted rates. This is the time Sri Lanka, or for that matter, any affected country, needs more money to get back to normalcy." The Colours of Angsana’s Deer Park Hotel (www.coloursofangsana.com/deerpark/index.htm), “situated in the Polonnaruwa district in the Northeastern part of the island was not affected at all” according to Banyan Tree Group spokesperson Agnes Tan. The area is approximately four hours inland and the access roads to Deer Park Hotel are clear. However, the opening of Angsana’s Swanee Hotel located in Sri Lanka’s Beruwela beach area and currently at the final stages of construction, is likely to be delayed till 2006. Two Amanresorts (www.amanresorts.com) – Amangalla (in Galle) and Amanwella – escaped damage. Both properties were open by March 2005. Amangalla, atop historic Galle Fort served as a refuge for many while waters rose. The Ocean View Guest House also located in Galle Fort reports that it has not been affected (www.oceanviewlk.com). 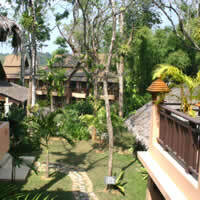 The Siddhalepa Ayurveda Health Resort in Ratmalana reports "all guests and hotel staff are safe. There was some [minor] damage to the beach area of the hotel but the property is fully operational." Jetwing Hotels reports that the Yala Safari Game Lodge has been affected and, sadly, there was "loss of life and property". The lodge is severely damaged. However, the Lighthouse Hotel, Tropical Villas, Blue Oceanic, Seashells Hotel, Ayurveda Pavilions and Sea Garden Hotel are fully operational. The Blue Water, Wadduwa and The Beach, Negombo, are also fine. The Eden Resort & Spa reports that it reopened for business on 1 February 2005 with the exception of the "ground floor rooms, main restaurant, lounge bar, gym and spa". Guests requiring bar or spa facilities will be offered alternative venues while repair continues, says hotel spokesman Anuksha Lovell. Useful telephone numbers: Hospitals: Colombo General Hospital [94-11] 269-1111, Castle Street Maternity Hospital [94-11] 269-6231, Colombo North General Hospital - Ragama [94-11] 295-9261, Colombo South General Hospital - Kalubowila [94-11] 282-2261, Sri Jayawardenapura General Hospital [94-11] 286-3610, District Hospital Avissawella [94-36] 222-2261. Government Ayurvedic Hospital [94-11] 269-5855. Ministry of Foreign Affairs [94-11] 536-1938. Most Maldives resorts managed to escapse major damage from the tidal surge, this despite the fact that the archipelago is just a few feet above sea level. Seventeen were badly hit. Most will be open for business before the end of 2005. The newly refurbished and extended Conrad Maldives Resort & Spa (www.conradmaldives.com) “was not affected and all guests and staff are safe and well,” says communications director Katherine Anthony. The resort is fully operational and re-opened its new-look Rangali Finolhu Island in July 2005 with completely rebuilt public areas and a new Spa Retreat. Said general manager Carsten Schieck: “We remained open [after the tsunami] the entire time. We generate our own power and produce our own fresh water from our desalination plant on the island." Tidal impact on Banyan Tree Maldives Vabbinfaru and Angsana Maldives Ihuru was also “minimal”. Says Agnes Tan, “The waves were broken by the reefs, which are far away from the resorts. The surge of water and mud damaged the jetty (now repaired) at Banyan Tree Maldives Vabbinfaru. Some of the villas at Angsana Maldives Ihuru were affected by flooding but they have been cleaned up and are running. There were no guest injuries. Both resorts are fully operational. On a recent visit I spotted no significant coral damage and there was marine life aplenty. 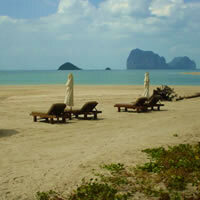 After a rock-bottom June, occupancies were extremely high in July 2005. www.banyantree.com. 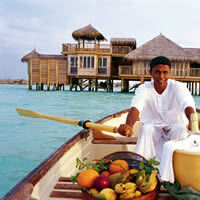 Six Senses reports that six villas in Soneva Fushi Resort suffered flooding and repair is underway. There were no injuries to guests. The Soneva Gilli Resort has been restored and reopened mid-2005. Malé Airport is fully operational now. Taj Hotels reports that the Taj Coral Reef (www.tajhotels.com) is functioning normally though Taj Exotica Resort & Spa will remain closed until the third quarter 2005. Resorts that are reported to be closed or seriously affected include Club Med - Kani (which plans to reopen end-October 2005), Dhonveli Beach, Fun Island, Gasfinolhu, Hakura Club, Kandooma, Kihadhuffaru, Medhufushi, Olhuveli, Velavaru and White Sands. The Four Seasons Resort Maldives at Kuda Huraa, "survived the tidal impact without any loss of life or serious injuries," according to general manager Armando Kraenzlin. "The safe evacuation of all of guests was expediently arranged within hours following the surge [with the help of a chartered] private plane. Guests of Four Seasons were evacuated to Doha when Male International Airport resumed operations." Four Seasons Kuda Huraa will remain closed until first quarter 2006. Still functioning with some repair work underway or just completed, are Dhiggiri, Alimatha, Gangehi, Moofushi, Nika, Paradise Island, Ranveli, Reethi Beach and Veligandu Island. One&Only Resorts, reports that One&Only Kanuhura is receiving guests though "20 water villas and suites have been removed from service". No casualties were reported at One&Only. The Rihiveli Beach Resort - Maldives, reports that it will reopen on 14 March, 2005. The property has undergone repair and overhaul. Useful links: www.visitmaldives.com or e-mail info@maldivestourism.gov.my. Island holidays has a regularly updated list as well. E-mail them at holidays@dhivehinet.net.mv. No major damage is reported in the main tourist centres. According to Le Meridien, properties in Mauritius and India suffered no damage. Myanmar escaped lightly and beach areas are not affected. According to Martijn van der Valk, general manager of the venerable The Strand (www.ghmhotels.com) , Yangon, “At 7.40am on Sunday 26 December we felt a three-minute minor earthquake, shaking beds and tables and chairs, and swinging chandeliers.” The hotel is unaffected and the airport is functioning normally. 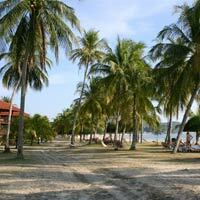 The Bayview Resort on Ngapali Beach reports that the hotel is “not affected” and beach activities continue normally. Says Kant: "There are no travel advisories [preventing] travel and only situational reports...regarding the affected area of Andaman and Nicobar and eastern coasts have been issued. There have been no reports of loss of life or injury to foreign tourists." Goa is completely unaffected and continues to function normally. The Andaman and Car Nicobar Islands being closest to the quake epicentre suffered very extensive flooding and tidal damage. Assessments are underway. Relief efforts have been hindered by the destruction of jetties. Numerous aftershocks measuring between five to six on the Richter scale have been experienced in the region. Tidal activity has returned to normal. Kerala, on the lower west coast of India, remained “largely unaffected” by the tidal surge. Kovalam Beach remains “safe” and operational. Hotels in Kumarakom, Alleppey, Marari and Varkala report normal operations. In the Kollam and Alleppey areas the coast suffered agitation but the backwaters, famous for their houseboats and day cruises, are unscathed. According to principal secretary Kerala Tourism, Bharat Bhushan, there is no worry about any health epidemic in Kerala. "Teams of doctors have been deployed in high-risk areas and medical supplies are adequate." No loss of life has been reported as yet in Kerala. Beaches in Trivandrum (Somatheeram, Chowara) are safe. Watch is being maintained along the coast especially near tourist sites like the shore temple of Mahabalipuram. Several sea cottages in the vicinity suffered damage. Travel agents recommend waiting till early January 2005 before exploring travel to Mahabalipuram. The MGM BR property is seriously damaged and is closed until further notice. Taj Fisherman’s Cove (www.tajhotels.com) in Chennai has escaped major damage and only "eight villas on the seafront were affected," says Gev Patel, of Taj Hotels. The hotel is functioning normally. Also in Chennai, the Taj Coromandel and Taj Connemara were not affected at all, as they are based downtown well away from the coast. GRT Temple Bay suffered superficial damage and plans to resume bookings from 15 January 2005. Sterling Mahabalipuram has no damage and is running while Ideal Beach is currently closed. Most inland Chennai properties are functioning normally and access roads are clear. Useful telephone numbers: India Tourism Chennai tel: [91-44] 2846-1459, 2846-0285 or e-mail indtour@vsnl.com. The city is recovering and getting back to normal. Auroville was not affected. Government of Pondicherry office of the Chief Secretray tel: [91-413] 233-4145, 233-5512. If you have useful, specific information on hotel damage, recovery, access roads and airport operations in affected areas, please do Send Us Mail. The tsunami surge reached right across the Indian Ocean to Seychelles but did not cause great damage. Some properties that reported superficial damage are L'Habitation Cerf, Blue Lagoon and Casuarina Beach. Other mildly affected areas include Praslin Island - La Reserve, Paradise Sun, New Emerald Cove, Acajou, Cafes des Arts, Le uc Praslin, Berjaya Praslin Beach, Less Villa D'Or - La Vanille, Indian Ocean Lodge, Villa de Mer - and La Digue Island - La Digue Lodge, Patatran, L'Ocean, Paradise Flycatcher.